The Kingdom of heaven is like treasure hidden in a field which someone found and hid. Then in his joy, he goes and sells all that he has and buys that field. Again. The Kingdom of Heaven is like a merchant in search of fine pearls on finding one pearl of great value. He went and sold all that he had and bought it. When you look at the scripture I’m going to talk about three things today and all of them are within this scripture. Professor Susan Wolf who used to teach at Harvard and also John Hopkins, a set in her book, “meaning in life and why it matters. She said that there are, there have to be at least three elements for us to live a meaningful life. Three qualities or three elements. First one is passion. The second one is an active engagement. The third one is the objective of value. I like to reflect on the meaningful life today. Why is meaningful life important? Because meaningful life is a happy life, without meaningfulness. Happiness is not possible happy life is not just about having fun, a happy life is not just about enjoying the abundance of life. A happy life is not just doing well in your career all of those things are very important to make you happy, but by themselves that won’t give you a happy life because around you have seen people who have all those very unhappy, so happy lives. These are important things to have, but underneath there has to be one thing essentially, and that essential thing that you have underneath all these things is meaningfulness. In other words, you have to believe that your life is worth it. You have to believe that your existence is worth it. Your existence has some meaning and some value. If you don’t feel that my life has any meaning or value, then no matter what you do, you cannot have a truly happy life. So we human beings are created to pursue and search for the meaning. It is in our gene. It is coded genetically within us. So every human being who lives a good, happy life, they are searching for the meaning. So the meaning is, is very important in life. 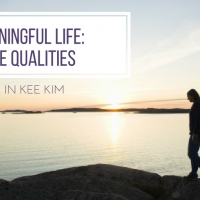 And I like to look at these three qualities or elements of meaningful life. The first one is a passion. There has to be a passion, in a meaningful life. Life Without Passion. There’s no meaning. I mean, you have to have something very important in your life. Something you’re passionate about. You know, one disease or poison that I see in modern generations when I look at their eyes, there’s no energy in their eyes. There’s no passion. They’re just: “Yeah. Yeah. Okay. I like it. Yeah. Yeah. But yeah.” Everything is just kind of a mediocre. You don’t have anything. You have nothing to be passionate, but I really want to eat this or I really want to do this or I really want to achieve this. We lack that kind of a passion. You know, life’s passion is like a furnace that Burns your existence, that Burns your life, say, and this energy that moves you forward. That’s what passion is. So like no matter how busy you are, how tired you are, the next morning you get up to do that, you get new energy. There’s always energy left to do that thing. That is passion. When you look at Jesus’ life, I think he was quite passionate, man. Nothing could take away his passion. Even the cross cannot take away his passion. He went all the way to the cross to live out his passion. Nothing could threaten to take away his passion. No threat was powerful enough to stop Jesus’ passion. Whatever you decide to do, I realized that you will experience obstacles, obstacles always we experience. You cannot achieve anything without obstacles. When you do certain things for so long and then you realize that you’re hitting the wall. You cannot go any further. You hit the wall and most people give up right there, but it is a passion that break through the wall. It is a passion that breaks down, that obstacle, with that passion, you can overcome obstacles. All the great people don’t think that they had an easy, easy way, easy time. They all experienced obstacles, probably the wall higher than the other walls that we experience. They experience, tremendous obstacles, but they went through the obstacles because they had a passion in their lives. There is a will, there is a way, there is passion, there is a way when you have passion, the door is open for you and the road is an opened up for you. The way you can see. so passion really opens your eyes to be able to see the way a person with this passion. Her name is Dorcas Gordon. Dr. Dockers, Dorcas Gordon a, she used to be, she just retired, but she used to be a principal of Knox College, but when she went to theological seminary, people called her your demon possessed. Why? Because you’re a woman studying theology. He was like that a few decades ago. He was like that your woman and you’re studying theology, you must be like a demon possessed or whatever. That threat or that kind of attitude did not stop her. Her passion overcame that obstacle. She was not discouraged because of that. And as she went all the way and at the school as well, where is she was labeled as Demon possessed. She even became the principal, the leader of their school. That’s what passion does. To live a meaningful life. You have to have passion. I hope that all of you think about what your passion is. What is, what is your passion for life? Think about it. It’s amazing to have passion. Some older people have passion like Kathy’s father. His passion for photography and the other last night he came to me, Reverend, I guess from my store, I got some kind of rebate from the government. And then please tell my wife I need a new full frame camera. Her, his wife will not be buying the cameras. He asked me to ask you is why? Oh, you gotta have some passion. Whatever that is. And in passionate is something that you, you need to cultivate. If you’re taking everything so mediocre and everything becomes mediocre, but when you rip passionate about, then you can cultivate. You can build that passion within you. Second, the passion by itself is not enough. You need a channel through which your passion becomes actualized. Otherwise, it just becomes a vain dream. You need to actively engage to do something about your passion. Passion has to be translated concretely into something concrete. Are you engaging? We have to constantly ask ourselves, what are you gonna do about it? Dorcas had a passion and then I’m in via principle of no now’s college or to be a professor in theology, you have to have a Ph.D. I mean, she had four children and she told me, I mean, she, she and I are very close. She told me, you know when I studied, I had my babies on my back and I went to the class sometimes when the baby cries, she came out and then went back to the class. That’s how she finished her Ph.D. She did something about it. You have to constantly think about what are you gonna do about your passion. Nothing can be done easily. We have too many what ifs. What if I cannot do it? What if I fail? What if, what if? What if? Sometimes we never get to the anything where we constantly think about what if thousand miles journey begins with a small step. Actually, that word, that phrase when I first met Dorcas in her office when I entered in that agency, a thousand miles begin with a small step. It is important to take one step at a time when you actually engage in, engage in what you want to do. What do you experience? When don’t you engage it? You didn’t experience it, but once you actually engage in it, what do you experience? You experience failure. For those who never try, they never know what failure is, but people who achieve great things, they are very familiar with failure. Hey, when you actually get things, try to get things done. What you experiences feeling? Everybody experiences failure. Failure is a part of the process, is not a result. One succeeds without failure. People who never did anything about their lives with their lives, they don’t know what failure is for people who did wonderful things about life tape, all experienced tremendous failures. Michael Jordan, Michael Jordan became just market jewel Jordan because he was born with that talent. Of course, he was born with talent and height too. I can never be like Michael Jordan, but just because he was born with his physique and the talent, Michael Jordan did not become just mark Jordan. This is what he said, I can accept failure. Everyone feels like something, but I cannot upset not trying. He always tried. He always tried. He failed and failed and failed. He tried again and again and again. I mean I really love Tiger Woods these days. He’s not doing very well, so I’m very sad that he’s not doing very well. But, you know, after every game he used to always other people went to the clubhouse or whatever. He went back to the putting green and he was practicing because he was correcting himself. Failure and success are not two opposite ends. Failure is simply a process of success and part of it, failure is not a shameful thing. You shouldn’t feel embarrassed about failure. You shouldn’t be sensitive to your failure. Thomas Edison said I have not failed. I’ve just found 10,000 ways that won’t work. This is a great attitude, isn’t it? I mean, all of these great people have a great attitude of all their lives. They don’t see things as a failure, as a, as we reflect on the last week, they didn’t see it as a failure. They just learned something new that won’t work. To overcome failures, you need to be strong. You need to have a character. There is strong to overcome failures because most people will give up. What is the best way to make you strong? I believe that it is faith, faith that keeps you going, not your own strength, but the strength of faith. St Paul experienced tremendous difficulties and hardships in his life, a lot of persecutions, lot of oppositions, and he, he, he experienced a lot of failures too. Well, what kept him? This is what kept him going. He said I am confident of this, that the one who began a good work among you will bring it to completion by the day of Jesus Christ. That’s what kept him going. Even though I feel God never fails, even though I cannot take anymore, God will continue and it is God who’ll who began a good work and it is God who completed in your life have that kind of attitude. Then you will never give up. This conviction drives us and compels us to keep knocking even when we feel that the door is really quite tight shot. We’ll keep knocking. Finally, whatever we do for your life to be meaningful, it has to have objective value. No matter how passionate Hitler might’ve been and how concretely he lived out, his passion to conquer the world. I won’t say that that life is meaningful life because it lacks objective value. Conquering the weak and the vulnerable concrete. Other countries cannot have objective value. When I look at Jesus’ life or Paul’s life, I can see their worldview. I can see their philosophy of life. They lived in the world where there were no human rights for women and rice, for the slaves. They’re primitive society. The powerful, always conquer the weak and the vulnerable, but even in that society, Jesus thinking and Paul’s thinking, we’re very different. This is what Jesus said, but Jesus called them to him and said, you know that the rulers of the gentiles lorded over them and their great ones are tyrants over them. It will not be so among you, but whoever wishes to be great among you must be your servant and whoever wishes to be first among you must be your slave, just as the son of man came, not to be served, but to serve and to give his life a ransom for many that is a very, very different thinking from the society he used to live. He is more than 2000 years ahead. He always thought about objective value. This is what Saint Paul said. See, Paul’s teachings are seen. There is no longer a Jew or a Greek. There is no longer a slave or free. There is no longer male and female for all of your one increase. Jesus this theme in this crazy statement 2000 years ago, what are you talking about, Paul? But he said that prejudice was taken for granted in Jesus’ life and Paul’s life, and yet they preached equality. What they try to do had objective value, meaningful life doesn’t have to be big and glamorous. A meaningful life is our everyday living. Objective. Value has nothing to do with people’s recognition. Objective value has everything to do with being helpful to others in whatever way it may be. These three things, so what are those three things? First of all, passion, a second activity, engagement, third objective value. Think about it. A meaningful life is a good life. A meaningful life is a happy life. I want all of you to live with passion, to do something about with your life, even though it is short and through your life. I pray that other people get tremendous benefit. Let us sing together.